Dawngate, EA's attempt at snatching the MOBA crown from League of Legends and DOTA 2, is exiting this world as quietly as it entered. Today EA abruptly announced that the game is shutting down in 90 days. "Today, I have the unenviable task of announcing that we've decided to stop development of Dawngate." 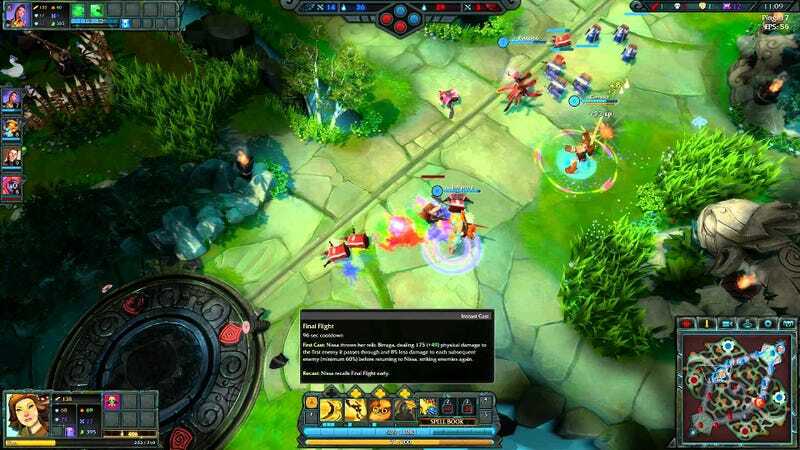 " Dawngate has been in beta for almost 18 months, including a full open beta for the past six months. Through that time, we've taken a lot of feedback from players and delivered lots of new features and innovations. And although the game has grown, we're not seeing the progress we'd hoped for. This isn't the outcome we wanted, but beta testing is about learning and improving, and ultimately, about making difficult decisions about how to proceed." "As a part of the process of closing down Dawngate, we'll continue to operate the game for the next 90 days. All players will be entitled to a full refund of any money spent during the beta. For most players, we'll process those refunds within the next 10 days. If we don't have current payment information on file for you, we'll need to reach out first before initiating the refund. If you have any questions, you can reach us at help.ea.com." Dawngate was announced last year, albeit with less of a confetti-ridden trumpet blast than typical EA fare. Despite that, this shutdown kinda came out of nowhere. The game just received a fairly substantial update last night!